I created a video to show the results from putting the HoloLens to the test with un-optimized code and then record the two different ways (streaming and direct recording on the device). I show the app as it runs natively on a relatively beefy PC. The purpose is not to try and demonstrate the performance of the HoloLens. 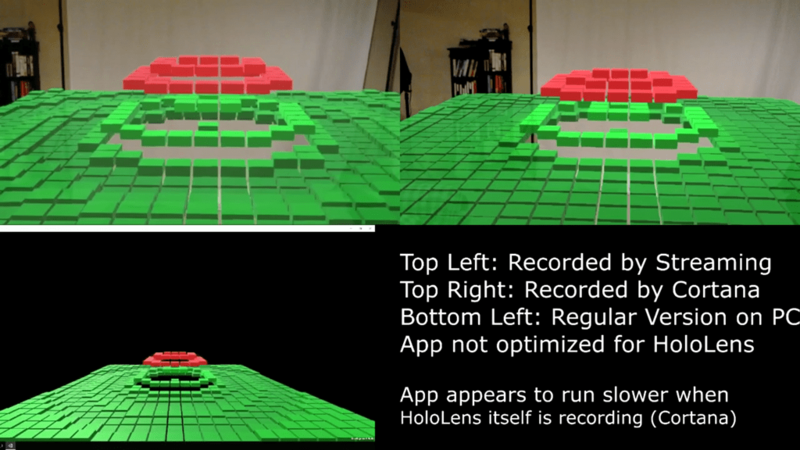 Instead, it is to see which recording method is the best on the HoloLens when it is already at its max capacity. My conclusion is that recording directly on the HoloLens takes more of a toll than having the HoloLens stream what it sees to another PC. Now, chances are if my app was really network traffic heavy then it could be better to record directly on the device. As with anything, your mileage may vary. Hopefully this was beneficial for you. Let me know what your thoughts are in the comments!